Whether you’re planning a short getaway or an fun-filled holiday with the family, Magic Breaks have got all the tools including expert advice on everything you need to know about Disneyland Paris. Boasting competitive prices for tailor made holidays and getaways, Magic Breaks can piece together your trip to the Magical Paradise of Disney, exactly the way you and your party want it! The specialist team are on hand 7 days a week sourcing new deals so you and your party can find the perfect package at an unbeatable price. Magic Breaks aim to create the perfect holiday for all their clients whilst ensuring they stick to your preferred budget so you can guarantee the holiday you’ve been dreaming of without breaking the bank! What’s more, they do their very best to secure early booking discounts and special offers so you get the very best deals available. Stay at a Disney Hotel and take advantage of the Disney Parks to ensure your Magic Breaks stay is one to remember. Book your tickets, accommodation and unique trips with the help of Magic Breaks and use one of our Magic Breaks Voucher Codes to help save you money off your next booking and enjoy more money to spend on souvenirs! After your magical and fun-filled day at the Disneyland Park - the fun doesn’t have to stop there! At Magic Breaks, you can book one of the Disney Hotels, so you can enjoy the Disneyland experience at night too. Using one of our Discount Code means you can enjoy your stay for less, sound tempting? At Magic Breaks, you can select one of the many Disney themed hotels available including New York, Cheyenne, Santa-Fe or Davy Crockett Ranch themes. Check out the one of a kind hotels today and rest assured the best price online at Magic Breaks and make your Disneyland Holiday one you will truly remember. No so far away, there is a magical kingdom where dreams come true! Home to Disney Heroes and Heroines who live happily ever after, Disneyland Park is a story book of fun, adventure and dreams. Begin your journey with Magic Breaks where you can grab a great saving off your next booking to Disneyland Park and revel in the mystery, excitement and fun of all Disneyland Park has to offer. Explore Frontierland where you can saddle up some serious fun in the wild west. Dust off your wings and head into Fantasyland or turn the page and delve into the past and live extraordinary visions in Discoveryland. With something to offer all ages, Disneyland Park is where anything is possible so begin your story today with Magic Breaks. Is there a Train Station close to Disneyland? The Marne-la-Vallée/Chessy train station is located right at the gates of the Disney® Parks and just minutes away from all of the Disney® Hotels. It takes 35 minutes from Paris by regional train RER or 2 1/2 hours by Eurostar from St Pancras International and 2 hours from Ashford, Kent. Can I ammend My Booking? If you wish to make any changes to your booking, you will need to head to the Manage My Booking page. You will need the Lead Passengers Surname, your File Number Reference and Postcode. From here, you can access your booking. Any changes could possibly incur a charge depending on when you’re travelling. If you’re yearning for a magical getaway to Disneyland, there is no better place to book your adventure than with Magic Breaks. 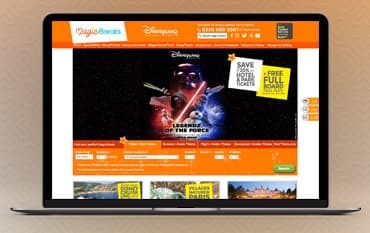 As a friendly to use and trusted partner of Disneyland Paris, you can guarantee you will find the perfect break away for you and your family at Magic Breaks. Book online using one of our Magic Breaks Promo Codes to help secure you a great, money-saving deal which is guaranteed to make your next break that extra magical! We are constantly on the hunt for Promo Codes for MagicBreaks to help you with your money saving. Our experts check dozens of sites for secret codes including NHS discounts, student sites & social media channels saving you time & money!